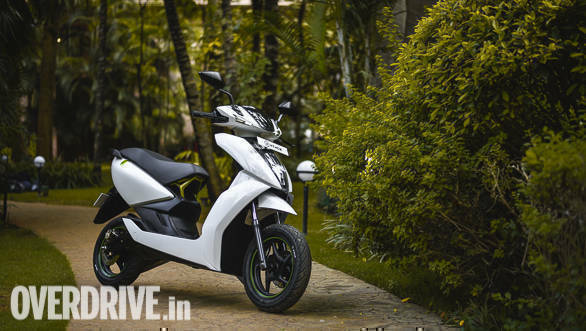 Ather Energy has launched its Ather 340 and Ather 450 smart electric scooters in India. While the more powerful 450 has been priced at Rs 1.24 lakh on-road, the 340 is priced at Rs 1.09 lakh on-road. Both scooters are identical to each other in every way, the only difference being the lower power output of the 340. Given their pricing, the Ather 340 and Ather 450 are thus the most expensive scooters in the country, but Ather Energy claims these are also the most advanced scooters on sale in the country, and that the pricing includes a host of features that will ensure a hassle-free ownership experience that will better owning a conventional scooter. Both scooters are powered by a BLDC (brushless direct current) motor that offers up to 5.4kW (7.3PS) of power in the 450 and up to 4.4kW (5.9PS) in the 340. Peak torque offered by the 450 is 20.5Nm while the 340 offers up to 20Nm  the torque outputs for both scooters are thus higher than 200cc entry-level performance motorcycles like the KTM 200 Duke and Bajaj Pulsar 220, which is impressive. 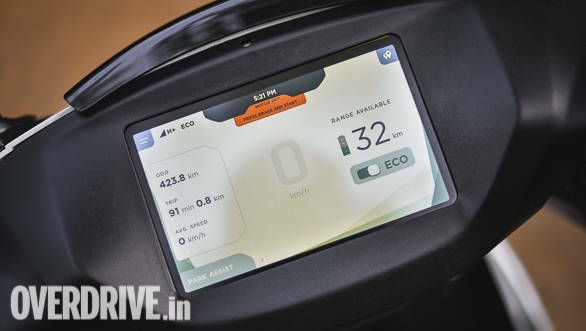 This translates to serious acceleration and the claimed 0-40kmph time for the 450 is a mere 3.9 seconds, says Ather Energy. A 2.4kWh battery pack is the source of energy and is dust and waterproof, with an IP67 rating and sits in the floorboard. Ather has also designed the scooter such that air is channeled to the battery pack directly from the front wheel, apart from providing the battery pack with fins underneath, to ensure there's adequate cooling. Of course, there's a cooling fan as well to ensure the battery does not heat up and has been tested in various conditions to ensure typical Indian summers are not a problem for the scooter. The electric motor sends power to the rear wheel via a belt drive, to ensure wear and tear and loss of power is minimal. The Ather 340 and Ather 450 both are shod with telescopic forks upfront and a monoshock at the rear. The scooters run on 12-inch alloy wheels shod with MRF tyres and get disc brakes at both ends, thereby ensuring there's adequate stopping power at all times. Another highlight is the touchscreen instrument cluster, which is in fact a 7-inch tablet equipped with a SIM card and is connected to the internet full time and offers onboard navigation. Prices for both scooters are introductory and includes a 'home charging point' or dedicated charging station for the 450 along with standard installation and a charging cable as well. Pricing for the 340 does not include a home charging point. Pricing for both scooters includes a free 1 year subscription, which if purchased separately costs Rs 9,912 for a year or Rs 2,596 for a quarter. Called Ather One, the subscription ensures you do not have to pay for charging your scooter at all  irrespective of whether you charge it at home or through an 'Ather Grid' charging station at a public place. Effectively, Ather Energy will pay the host of the public charging station directly and reimburse you the amount spent on electricity for charging at home every three months. The Ather One subscription plan also takes care of maintenance  Ather says effectively servicing and maintenance of the scooters is free as you won't need to pay labour charges or for consumables like brake pads and the like. Data services like navigation, diagnostics and updates are included in the subscription plan as well, along with roadside assistance. You can read our first ride review of the Ather 450 here.